SELECT A SIZE * - None -5.0"5.5"6.0"6.5"7.0"7.5"8.0"8.5"9.0"9.5"10.0"
I'll pick a single condition from the list. The text picked by the user who chose "I'll pick a single condition from the list". The Classic medical ID bracelet is made of stainless steel and is our original design. An affordable and durable choice with various emblem color options, the Classic bracelet is an ideal medical ID for adults and children of all ages. MedicAlert IDs are globally recognized and provide a full suite of emergency response services. Your medical ID is the way emergency responders obtain health and personal information during your moment of need. Perfect for those living with cardiac conditions, diabetes, allergies, autism, Alzheimer’s or dementia and other medical conditions. Medical ID size: 1 3/8" x 3/4"
Whether you're ordering a bracelet, watch, or sports band, it's important your MedicAlert® emblem fits comfortably around your wrist. Please use this information to select your correct bracelet size. If you're ordering a necklace, dog tag, or other MedicAlert product, look at the item's "product specifications" for sizing information. To determine your size, snugly wrap a tape measure around your wrist. Note the measurement, then add half an inch. 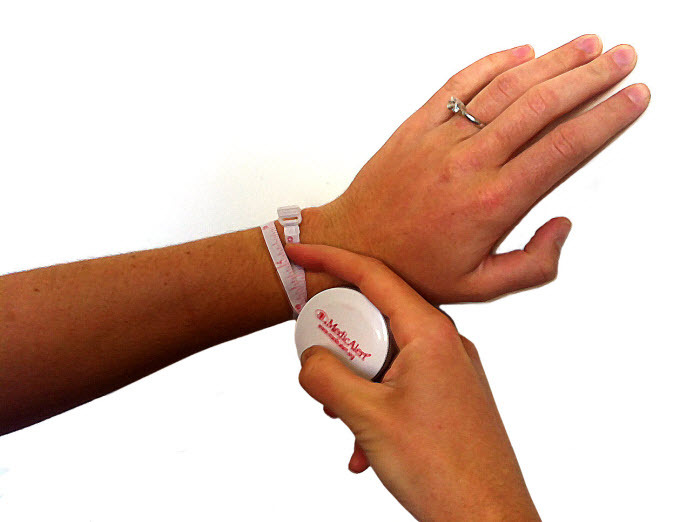 This is the size MedicAlert bracelet you'll need. For example: If your wrist measures 7 inches around, you'll need to order a 7.5 inch bracelet. Most of our metal chains are customizable in half inch increments. Sizes range from 5 to 10 inches. Stretch bands, sports bands, watches, and beaded bracelets come in set sizes. You may view their available sizes under the item's "product specifications". © Copyright 2019. MedicAlert Foundation is a 501 (c)(3) | EIN: 94-1494446 | MedicAlert® is a U.S. registered trademark and service mark.